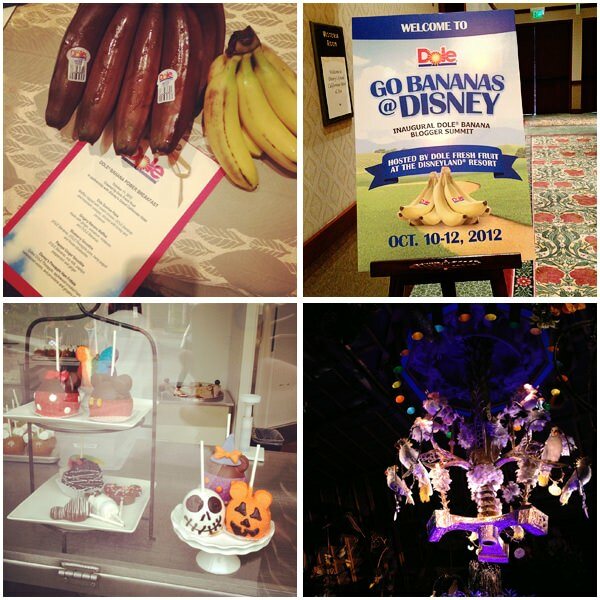 I recently got back from a few whirlwind days at Disneyland attending the first ever Dole Banana Summit. To say that I had a great time is an understatement. I got to see some old friends and come home with some new ones. Before I went, I really only thought of bananas as something that you grab on your way out the door, or bake into bread. But really, they are so much more than that. We ate bananas in so many forms, sweet and savory, that I really underestimated how versatile a banana can be. Breakfast at my house can be crazy. The bus comes pretty early for my taste and I do not always have the wherewithal to make much more than toast. 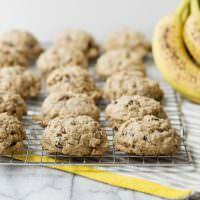 I found this recipe for breakfast cookies and thought that it might be a great to get a little more nutrition into my babes before I send them off to start their day. Full of bananas, whole grains, and protein, are a great way to start the day. I added some chocolate chips because I knew that I might have a better chance of the kids trying them. Feel free to leave them out. Bananas are nature’s energy bar – Bananas are portable and easy to digest. Chock full of fiber, potassium, manganese, vitamin B6 and vitamin C, they are proven to pack the same punch as expensive sports drinks. Bananas come is more varieties than just yellow. I never knew that there were different types of bananas. Red bananas are fruity with subtle raspberry and apple flavor. Banana peels can shine shoes and tenderize meat. Add a banana peel to marinating meat, and it will act as a tenderizer. Who knew? 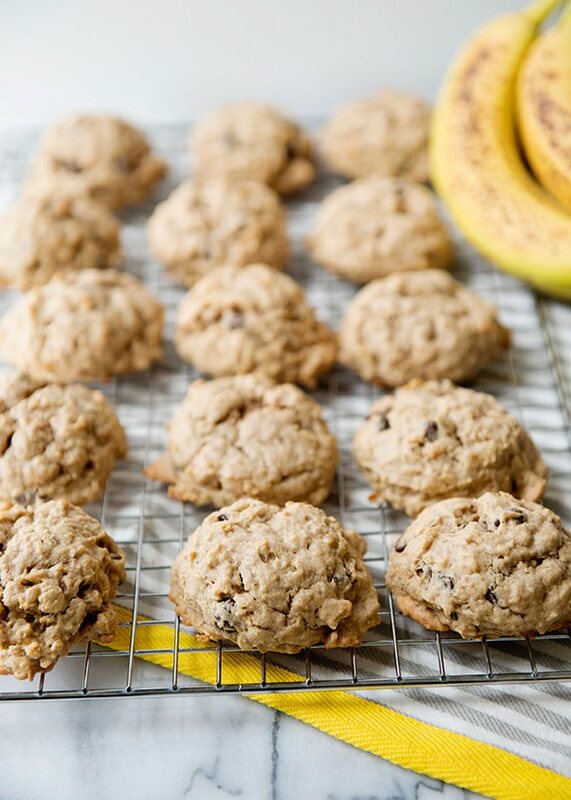 Bananas are not just for breakfast. Used in savory dishes they add a touch of sweetness. We had delicious bacon wrapped grilled bananas and Tostones that were breaded and fried with a mojo sauce. Dee-lish-ous. Dole and Disney have had a 36 year alliance and sponsor the Enchanted Tiki Room. Right in front of this attraction is the famous Dole Whip. I have been wanting to try this for ages and it was worth the wait. Thank you to Dole for having me and letting me be a part of the Banana Summit. And to Disney for truly being magical. I had some seriously jealous kids. 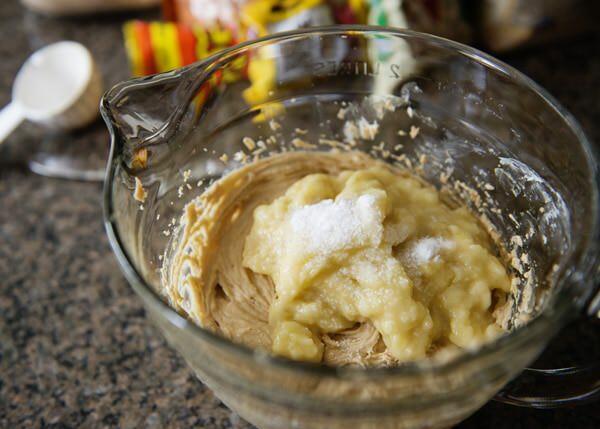 Cream peanut butter and butter with an electric mixer until light and fluffy. Add banana, baking soda, and salt. 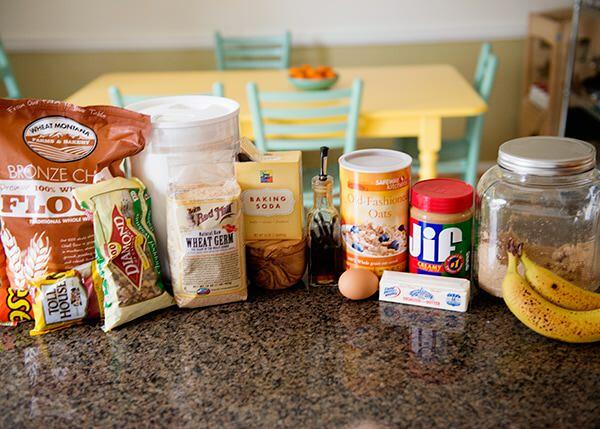 Mix in flour, whole wheat flour, and wheat germ. Mix until just combined. Stir in oats, chips, and walnuts. Drop onto a baking sheet, about 4 inches apart. Bake in a 350 degree oven for 15 minutes until the cookies are set and lightly browned. Cool for 1 minute on sheet and cool completely on a wire rack. These are best eaten within 24 hours, but they freeze really well. 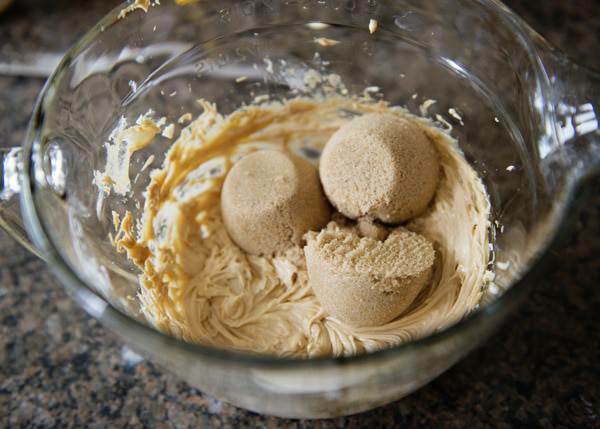 Cream peanut butter and butter with an electric mixer until light and fluffy. Add brown sugar. 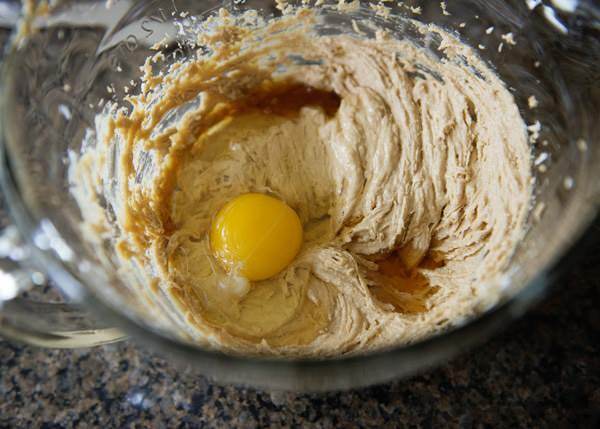 Add eggs and vanilla and beat until well mixed. Add banana, baking soda, and salt. 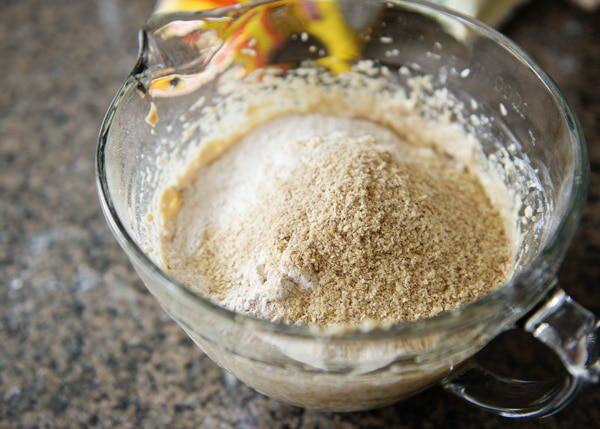 Mix in flour, whole wheat flour, and wheat germ. Mix until just combined. 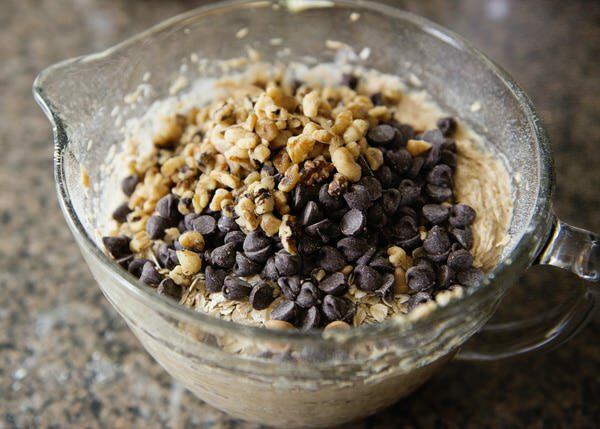 Stir in oats, chips, and walnuts. Drop onto a baking sheet, about 4 inches apart. Bake for 15 minutes in a 350 degree oven until the cookies are set and lightly browned. Cool for 1 minute on sheet and cool completely on a wire rack. These are best eaten within 24 hours, but they freeze really well. Travel and accommodations were provided by Dole, all opinions are my own. 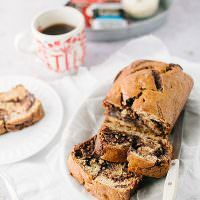 I love banana baked goods!!! These look great. You will love these Liz! Thank you Maria! It was great seeing you too. Caleb is a sweet potato. These sound delightful! Gotta love cookies for breakfast! These sound SOOOO good. I love bananas. these are great for a quick breakfast. 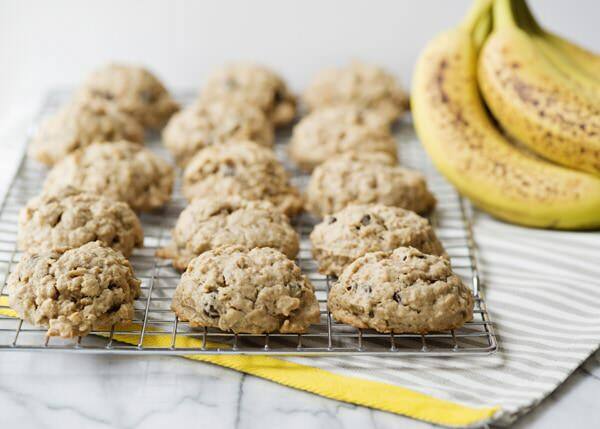 Love the idea of a breakfast cookie 🙂 Especially with oats, chocolate, and banana! Easy to grab and go. COOKIES, FOR BREAKFAST?? Haha I couldn’t resist. Reminded me of the Cookie Crisp commercials of yore. Love these! MMmmmm cookies for breakfast? Winning. Who knew about tenderizing meat with a banana peel? If I don’t have wheat germ, what would you suggest I use instead? Thanks for the great recipe! Leave it out. 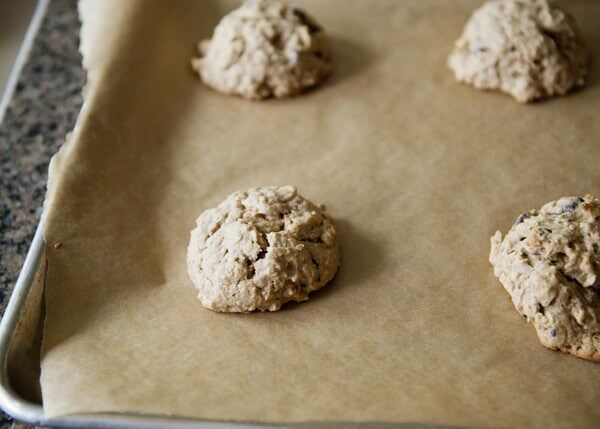 Use more whole wheat flour. I’ve been on a banana and peanut butter kick lately! These cookies will be just right for it. What temp for the oven. What temperature does the oven need to be set to? I’ve checked and double checked on the recipe, but the oven temp. is not stated anywhere. 350. Sorry, I’ll edit it. At what temperature should they be baked? 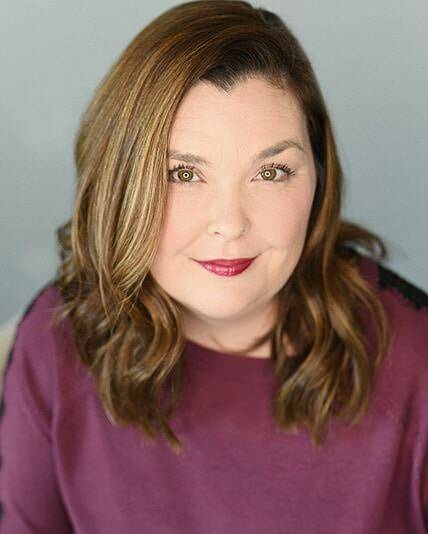 You too Julie! Thank you! Can I leave it out and continue with the recipe or would you recommend any adjustments to other ingredients? 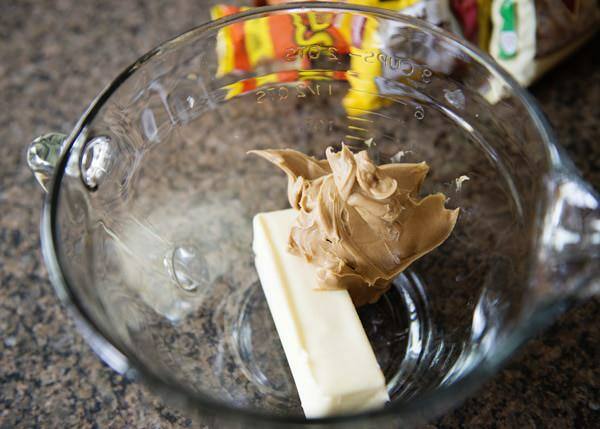 Either use a sub nut butter or try adding a little more banana. You will need a little moisture if you are not using pb. These cookies sound awesome. I bet dried cranberries would be good in these too. Any idea of the nutritional value break down? I bet they would! I have no idea what it is, I am sorry. I would probably use a combination. You need the sticky to help them stick together I would imagine. You have such beautiful children. Thank you for the recipes. Yours are always delicious. Made these years ago and just made them again yesterday morning, having remembered how good they were. Could probably figure about 50 cal/cookie? I’d say they aren’t super fast to make, but baking up a bunch in advance and freezing (I microwave from frozen about a minute and they are perfect) yields a great, quick, cookie/muffin hybrid that can’t be beat! I have no idea how many calories per cookie. I’m glad that you like them.